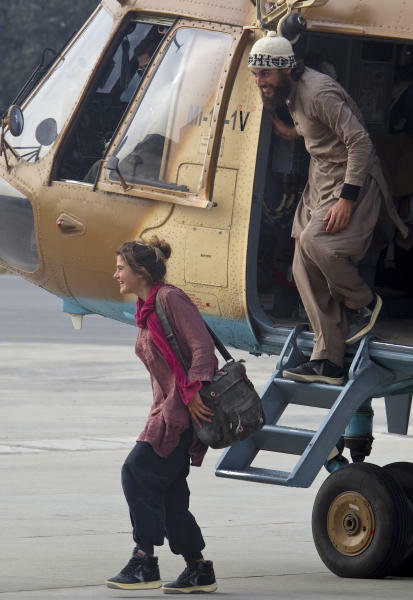 ISLAMABAD (AP) — A Swiss couple held captive for nearly a year by the Taliban in Pakistan turned up at an army post close to the Afghan border on Thursday, claiming to have escaped from their captors, the Pakistani army said. They were swiftly flown to safety by the military. Taliban commanders said a ransom was paid in exchange for the release of the man and woman. David Och and Daniela Widmer, smiling and looking healthy, briefly waved for waiting cameras at a military airbase close to the Pakistani capital before getting into a van. The couple, who were apparently on holiday in the country, were seized in July in the southwest province of Baluchistan. They appeared in a militant video in October, saying their captors were threatening to kill them. Maj. Gen. Athar Abbas said the couple showed up at an army post in Miran Shah in North Waziristan, an al-Qaida and Taliban stronghold. He said the couple was then flown to Peshawar, the main city in northwestern Pakistan, on an army helicopter. "They say they escaped from the custody of militants," he said. Two local Pakistani Taliban commanders said the couple had been freed, but only after an undisclosed ransom had been paid and some Taliban prisoners were released from Pakistani custody. They refused to give their names. The Swiss government said in a statement Thursday its ambassador in Islamabad was in direct contact with the couple and confirmed "they are uninjured and that, given the circumstances, they are doing well." It said the couple were taken by helicopter from the Miranshah region to Peshawar and later to Islamabad, and were being kept in a safe place and would return soon to Switzerland. Swiss Foreign Minister Didier Burkhalter "was clearly relieved at the good news" and thanked Pakistani authorities for their help, according to the statement, which made no mention of any ransom payment. Militants and criminal gangs often kidnap wealthy Pakistanis and less commonly foreigners. Large ransoms are often paid to secure their release, but such payments are rarely confirmed. There are at least five other foreigners currently being held in Pakistan. On Jan. 5, armed men kidnapped a British man working for the Red Cross in Quetta, the capital of Baluchistan, the violence-wracked province where the Swiss couple were also taken captive. Last August, a 70-year-old American humanitarian aid worker was kidnapped from his house in the Punjabi city of Lahore. Al-Qaida claimed to be holding the man, Warren Weinstein, and said in a video he would be released if the United States stopped airstrikes in Afghanistan, Pakistan, Somalia and Yemen. Associated Press writer Ishtiaq Mehsud in Dera Ismail Khan and Munir Ahmed and Chris Brummitt in Islamabad and John Heilprin in Geneva contributed to this report.